The flexible, high precision sample manipulators as well as the perfect charge compensation allow the analysis of virtually all kinds of samples, making our instruments the most flexible SIMS tools in the market. 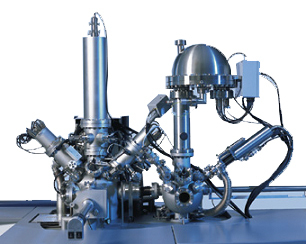 Due to the modular design, the instruments can be configured with a selection of optimised ion guns, sample preparation facilities and a variety of special accessories in order to address even the most challenging analytical tasks. The computer control of all instrument functions and parameters ensures ease-of-use and a high level of automation. ION-TOF has a strong tradition of collaboration with its customers to incorporate new ideas for hardware and software. The modular design of the TOF.SIMS 5 is ideal for customisation. In particular due to the horizontal sample concept a large variety of UHV sample preparation chambers, designed by our experts for individual customer's specific requirements, can easily be coupled to the instrument. These chambers can also be used to accommodate complementary analysis techniques such as XPS or AES.